The answer to this question depends on many factors. For a commitment-free quote, please contact us for more info. Replacing a roof, whether on a commercial or residential building, is a labor-intensive project and, depending on the type of roof, could take anywhere from a few days to 2 or more weeks. The time involved is substantially affected by the weather, as well. Wind, snow, rain, or even just the threat of one of these and will slow the process considerably. All-Pro installs most residential roofs in one day. 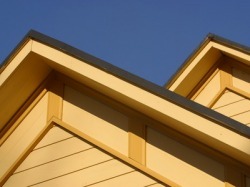 Depending on the size of your roof it may take an additional 1 or 2 days.